There are no words for this calamity. 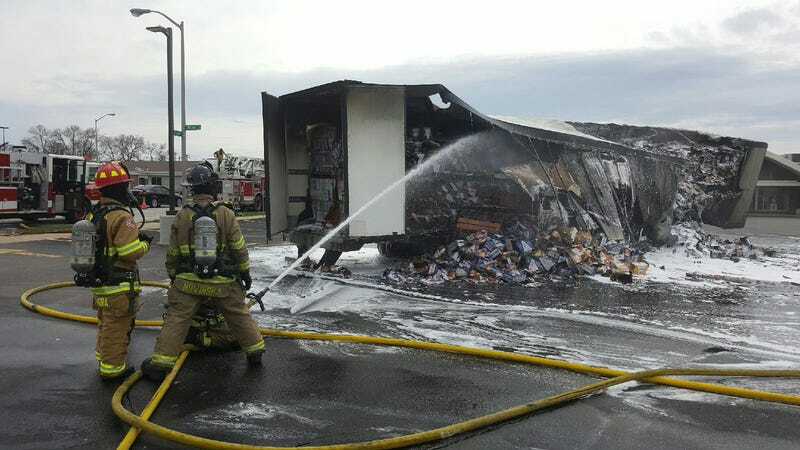 A big rig, hauling thousands of bags of shredded cheese—totaling 20,000 pounds—burned to a crisp in an Office Max parking lot in a suburb of Milwaukee, Wisconsin, WTMJ reported. The incident occurred earlier this week. The fire department told WTMJ that the truck driver was driving on the highway and noticed his brakes were on fire. He pulled into an Office Max parking lot and attempted to put out the fire himself. It didn’t work. The smell must have been incredible, too. Everyone pour one out for the nachos that might have been.